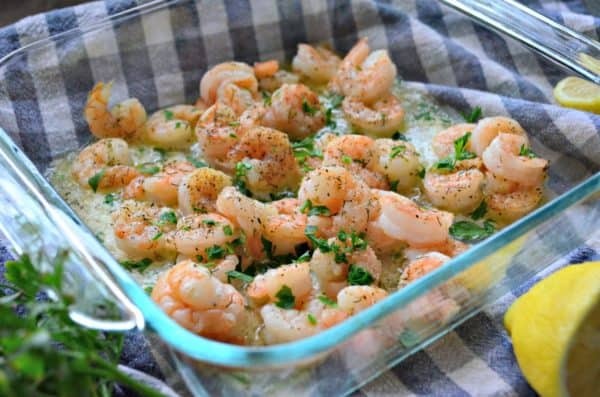 Baked lemon garlic shrimp is the perfect meal for seafood lovers. This cooking method and recipe is even easier then cooking on the stove top. School started last month for us. This means I’ve officially became a taxi service for a preschooler. I feel like my life now revolves in my car. Once we get home, I’m cooking lunch, then snacks and by the time it’s time for dinner, well– I’m spent! I’ve been reaching for simple dinners over the past few weeks, and this recipe for baked lemon garlic shrimp is about as easy as it gets! I first created this recipe two months ago, when our glass stove top was cracked and I couldn’t use it. We wanted shrimp scampi, but I knew I couldn’t cook it on the stove top. That’s when I decided to bake the shrimp. How do you bake shrimp in the oven? I’ll be honest–It never occurred to me to bake shrimp in the oven. I’ve always either cooked shrimp on the stove top sauteing in a frying pan or on the grill. You will need a glass baking dish. Either 9×9 or 9×12 to bake the shrimp in the oven. I like to use glass over metal. Metal can cook/burn the shrimp, so I always stick with glass. What temperature do you bake shrimp in the oven? I like to bake shrimp at 400 degrees Fahrenheit. High heat for 10 minutes is perfect. Your shrimp should be pink in color, and that’s when you will know they are cooked and ready to eat. I also watch the oven during the last few minutes of cooking. The last thing you want is over-cooked shrimp. What do you serve shrimp with? The sky is the limit on what you can pair with shrimp. Ideally I pair it with a starch like rice or pasta. But if you are doing a low-carb diet you can easily pair it with roasted or steamed vegetables. Here are a few of my favorite side dishes to serve with shrimp. If you are looking to simplify dinner and love shrimp. 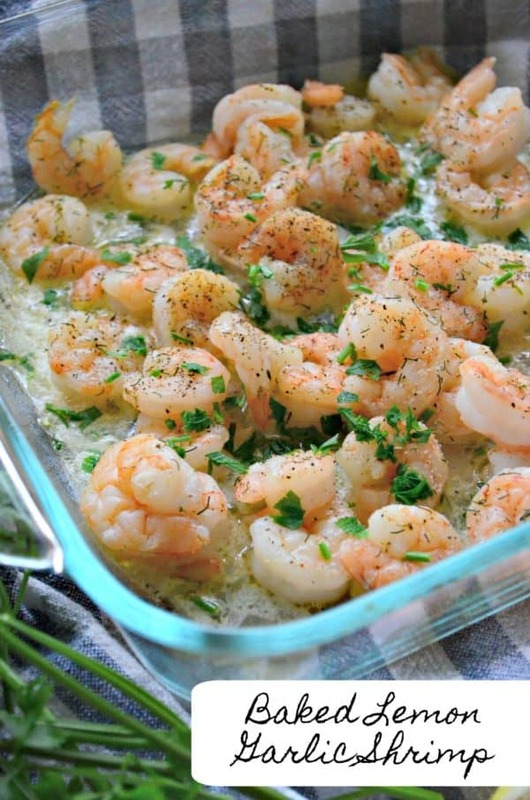 Definitely give this easy and flavorful recipe for baked lemon garlic shrimp a try. Preheat oven to 400 degrees Fahrenheit. Drizzle olive oil in a 8x8 glass dish. Peel, de-vein, rinse and pat dry the shrimp. Place the shrimp in the glass dish. Using your hands, coat the shrimp with the olive oil and minced garlic. Then, sprinkle with salt, black pepper, and dill on top. Scatter small pieces of ghee (or butter) around the baking dish. Place in the oven and bake for 10 minutes. Once the shrimp are pink and cooked remove from the oven. Drizzle the juice of half of a lemon on top of the shrimp. Sprinkle with fresh minced parsley, divide among plates and enjoy. Note: Like it spicy? Add a pinch of red pepper flakes during step 1!